AOAP will be partnering with varying organizations on webinars. Below are the webinars that are currently being offered by AOAP. All of the webinars qualify for CEU’s and the CEU’s are included in the registration fee. *** NOTE: Once registered for, webinars must be viewed immediately or the link will expire. Please do not register for a webinar unless you are planning on taking it right away. You will need to watch the webinar in its entirety and take the quiz immediately following watching it in order to receive CEU credits from it. ** The webinar links will be sent to you for viewing as soon as your registration is processed. Below are additional on-demand webinars that are currently available. Webinars will only be available for a short time with additional webinars being added throughout the year. Networking is how you, as a professional, build on the knowledge you obtain from a combination of schooling, job experience and educational experiences. The appeal of networking is just that, to obtain knowledge and make professional and social contacts. Meeting new people and building relationships are easier when you are comfortable approaching individuals and being approachable. This networking session will teach networking techniques in a safe, non-threatening forum. After you’ve practiced and honed your skills, you’re then be able to network without fear or anxiety. The success of our aquatic facilities and staff are a direct result of the education and training that our personnel are provided. In order for our staff to be successful and confident in their skills we must provide on-going in-service training to ensure that they are trained efficiently and are able to perform in emergency situations. This session will cover the importance of in-service training, the types of skills that should be included and proper documentation of such. We will also cover the importance of audits and various types of audits that you are able to provide at your facilities. Note & Float Campaign aimed at preventing drowning at aquatic facilities throughout the country. The program targets parents with children who cannot swim. The heart of the program is first identifying all non-swimmers who enter the facility, and then “floating” those swimmers with an appropriately sized lifejacket. 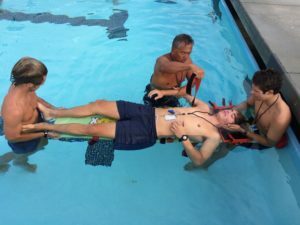 This vitally important and much needed program will prove to be a real lifesaver at pools and water parks around the country. The reason for the development and release of the Note & Float program is simple: too many non-swimmers are needlessly drowning at lifeguarded facilities and too much finger pointing is aimed at responsible parties. The implementation of the program is easy and can be accomplished in an easy fashion. Good maintenance at an aquatic facility may be most visible in its clean, appealing environment. This is not an accident. It is done through careful attention to a planned maintenance system. Planning the day to day work, planning equipment maintenance, and planning for large maintenance projects or equipment replacement are the building blocks of effective maintenance planning. Develop the plan based on the facility and equipment while keeping an eye out for changes in legislation and current events. Good planning is all about staying one step ahead of change so an operator can have prepared options when change becomes necessary. DON’T DO IT! It seems we hear a lot about what not to do – bullying and rudeness. So what should we do? What does it mean to act civilly? How do we avoid or defuse situations of unprofessional or rude behavior to create a respectful and productive workplace? Understanding the rules of civility, and creating a professional presence, will help to reduce conflict, build productive relationships, and a foster a positive professional reputation.